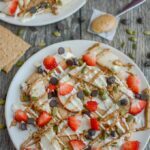 These Apple Graham Cracker Snack Nachos are a fun after school treat for the kids. A great way to mix familiar and new foods and make eating fun! other options: Sweet potato toast slices, avocado toast slices, anything else you can think of! For a pretty drizzle, put the yogurt into a ziploc bag, cut the corner off and squeeze to drizzle as desired. For the peanut butter I just microwave it for 30 seconds or so to make it runnier and then drizzle off a spoon.